OFEL, Hoodna Orchestra’s new concept album, is an immersive experience, a call to venture into the unknown, dare to feel what cannot be seen. Dive deep into the music, to the tenebrous depths where the light does not penetrate, to wrestle with the monsters and discover the dark, in all its power. Hoodna Orchestra is an ensemble of outstanding musicians, talented individuals dedicated to a process of searching and open to discovery, whether they are delving into the African sources of Western music, or following a string of thought, a musical phrase, an insistent rhythm. It is possible to discern different influences in the music, all merging together to create a distinctive, unique sound. The word Ofel in Hebrew means “dark” and the album reflects a willingness to explore the possibilities of the dark, open to discovering anything that might be out there, and searching the darkness within as well. 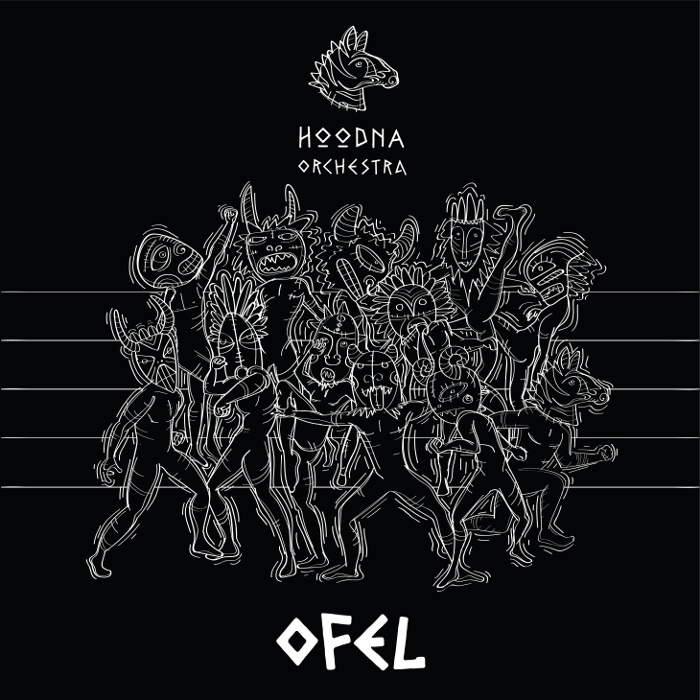 Hoodna’s OFEL is a dark that is vast and diverse, there is humor in this album, light within the darkness, and throughout – fascinating, intoxicating rhythms. Hoodna’s Ofel is a subversive dark that insinuates itself into all the hidden places of the body and demands: dance. There is an intimation of danger in the Intro, an invitation and a challenge – to follow the thread of melody into the labyrinth, to seek out the beast. To walk out into the abyss, confront the unknown. The title track Ofel I is a gathering of spirits, a summoning, an invocation. Opening with the deep bass tones of a seductive, insistent rhythm, to which the rising energy of the brass responds. Undulating keyboards with an exciting undercurrent of percussion join in, rising to meet the dark. There is a tension in the complex, densely textured sound cut through by something wild, a wandering wail, a battle cry – then silence. Breathe, the third track, is an instrumental cover of The Prodigy’s song written by Liam Paul Paris Howlett, Keith Charles Flint and Keith Andres Palmer. Imagine my surprise to find that this arrangement is full of groove – serpentine, deadly, beautiful. Rexico begins slow and almost solemn, then a bold rhythm rides the ominous chords on into battle. Power Ballad is a piece with a slower tempo and mournful brass. Ofel II is evocative, haunting. A wandering song in the wilderness met by a compelling rhythm. EF-M moves fast and lively – if you are listening to this song and realize you are not dancing, you may want to check your pulse. Beit Lechem (Hebrew for Bethlehem) is one of my favorites. Slow, somber chords open into a dark electric rhythm, and the brass dances above. The flow is punctuated by a herald and a warning, reminding me of the poem The Second Coming by William Butler Yeats: “And what rough beast, its hour come round at last, / Slouches towards Bethlehem to be born?” Playful keyboards are cut by a flash of lightning, the dark electric warning call, breaking off into silence. Then a lonely electric guitar wanders in, the traveler whose eyes have seen into the darkness, and keeps going on, following the music as it opens out. There is a lyric beauty to this sequence, something almost triumphant. Yet it fades out, and the darkness comes, vast and powerful, in the rough distortion, an orchestrated chaos of sound and sudden, silences. Then the chaos and strange rhythms merge, as if to say – wherever I’m going, that is the way. The final track Outro, is brief, yet potent. There is a sense of chaos, and a sense of direction within that chaos; the two forces rise and merge, ending the album on a powerful and enigmatic note. The album launch for OFEL will take place on Wednesday, October 17, 2018 at TEDER (9 Jaffa Road). Doors open at 21:00, admission free. Music composed by Ilan Smilan except Breathe, by written by Liam Paul Paris Howlett, Keith Charles Flint and Keith Andres Palmer. Elad Gellert – baritone saxophone; Rom Shani – alto saxophone; Eylon Tushiner – tenor saxophone; Uri Selinger – trombone; Asaf Oseasohn – trumpet; Sefi Zisling – trumpet; Arthur Krasnobaev – trumpet; Tomer Zuk – keyboards; Amir Sadot – bass guitar; Ilan Smilan – electric guitar; Matan Asayag – drums; Rani Birenbaum – percussion; Shahar Ber – percussion; Raz Eytan – percussion.